Just a short drive from Easington, osteopathy and massage treatment is provided by the friendly team at Vitaphysical. Whether your goal is recovery, rejuvenation or relaxation, Vitaphysical can help. First founded in 2007 under the name of Sunderland Back Pain Centre, Vitaphysical successfully treats a host of conditions under the care and direction of founders osteopath Jason, and massage therapist, Bronyia. Over the years the team has helped thousands of patients, treating conditions such as frozen shoulder, sciatica and relieving the pains of arthritis. 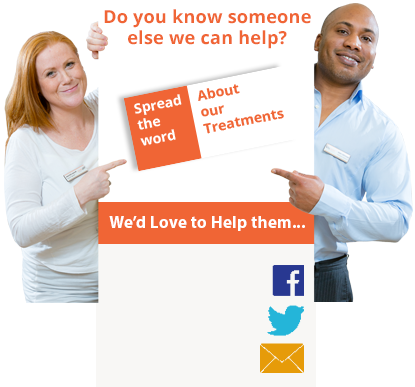 Visit our what we treat page for further details of the extensive range of conditions tackled by the experienced staff. The massage therapy selection on offer at Vitaphysical is second to none. If you’re looking for massage in Easington or the surrounding area, you will want to review the range of treatments provided by massage therapists Bronyia, Emma and Kirsty. Alongside traditional massage treatments like full body massage, deep tissue massage and relaxation massage, we offer Thai massage, pregnancy massage and sports massage. Whether you’re in the mood for relaxing or you would like to boost your recuperation after an accident, our therapists are on hand to help. We find that many of our patients who come to us from Easington and beyond have tried other types of treatment with limited success. This might include courses of physiotherapy or visits to private chiropractors. We’re very proud of the high level of satisfaction among these clients and offer a 100% money back guarantee on all of our courses of treatment. If you’re not quite sure what type of treatment is right for you, get in touch to discuss your case with our osteopath Jason. We’ll talk you through your options and find the best fit for you. Download some of our discount vouchers and you will also receive a discount on your first treatment with us. The Vitaphysical centre is based approximately 20 minutes drive from Easington. You’ll find us on John Street, Sunderland – a short trip along the A19. We offer free patient parking on site and are conveniently placed a short trip from Sunderland train station. To book an appointment with us, use our online booking form, forward a query by email on info@vitaphysical.co.uk or telephone for your free consultation on 0191 565 886 now. We look forward to welcoming you at Vitaphysical for treatment soon.